Dogbert: So, Since Columbus is dead, you have no evidence that the earth is round. Dilbert: Look. You can Ask Senator John Glenn. He orbited the earth when he was an astronaut. Dogbert: So, your theory depends on the honesty of politicians. Dilbert comic strip (10 Oct 1989). A rock or stone is not a subject that, of itself, may interest a philosopher to study; but, when he comes to see the necessity of those hard bodies, in the constitution of this earth, or for the permanency of the land on which we dwell, and when he finds that there are means wisely provided for the renovation of this necessary decaying part, as well as that of every other, he then, with pleasure, contemplates this manifestation of design, and thus connects the mineral system of this earth with that by which the heavenly bodies are made to move perpetually in their orbits. Theory of the Earth, with Proofs and l1lustrations, Vol. 1 (1795), 276. Against filling the Heavens with fluid Mediums, unless they be exceeding rare, a great Objection arises from the regular and very lasting Motions of the Planets and Comets in all manner of Courses through the Heavens. From Opticks: Or, A Treatise of the Reflections, Refractions, Inflections and Colours of Light (1718), 339.
:Let us then take the whole universe as our standard of constancy, and adopt the view of a cosmic being whose body is composed of intergalactic spaces and swells as they swell. Or rather we must now say it keeps the same size, for he will not admit that it is he who has changed. Watching us for a few thousand million years, he sees us shrinking; atoms, animals, planets, even the galaxies, all shrink alike; only the intergalactic spaces remain the same. The earth spirals round the sun in an ever-decreasing orbit. It would be absurd to treat its changing revolution as a constant unit of time. The cosmic being will naturally relate his units of length and time so that the velocity of light remains constant. Our years will then decrease in geometrical progression in the cosmic scale of time. On that scale man’s life is becoming briefer; his threescore years and ten are an ever-decreasing allowance. Owing to the property of geometrical progressions an infinite number of our years will add up to a finite cosmic time; so that what we should call the end of eternity is an ordinary finite date in the cosmic calendar. But on that date the universe has expanded to infinity in our reckoning, and we have shrunk to nothing in the reckoning of the cosmic being. We walk the stage of life, performers of a drama for the benefit of the cosmic spectator. As the scenes proceed he notices that the actors are growing smaller and the action quicker. When the last act opens the curtain rises on midget actors rushing through their parts at frantic speed. Smaller and smaller. Faster and faster. One last microscopic blurr of intense agitation. And then nothing. In The Expanding Universe (1933) , 90-92. As he sat alone in a garden, he [Isaac Newton in 1666, age 24] fell into a speculation on the power of gravity; that as this power is not found sensibly diminished at the remotest distance from the centre of the earth to which we can rise, neither at the tops of the loftiest buildings, nor even on the summits of the highest mountains, it appeared to him reasonable to conclude that this power must extend much further than was usually thought: why not as high as the moon? said he to himself; and if so, her motion must be influenced by it; perhaps she is retained in her orbit thereby. View of Newton's Philosophy (1728), preface. In William Whewell, History of the Inductive Sciences (1847), Vol. 2, 166. Pemberton's narrative is based on firsthand conversations with Newton himself. Astronomy teaches the correct use of the sun and the planets. These may be put on a frame of little sticks and turned round. This causes the tides. Those at the ends of the sticks are enormously far away. From time to time a diligent searching of the sticks reveals new planets. The orbit of the planet is the distance the stick goes round in going round. Astronomy is intensely interesting; it should be done at night, in a high tower at Spitzbergen. This is to avoid the astronomy being interrupted. A really good astronomer can tell when a comet is coming too near him by the warning buzz of the revolving sticks. In Literary Lapses (1928), 128. But that which will excite the greatest astonishment by far, and which indeed especially moved me to call the attention of all astronomers and philosophers, is this: namely, that I have observed four planets, neither known nor observed by any one of the astronomers before my time, which have their orbits round a certain bright star [Jupiter], one of those previously known, like Venus or Mercury round the sun, and are sometimes in front of it, sometimes behind it, though they never depart from it beyond certain limits. All of which facts were discovered and observed a few days ago by the help of a telescope devised by me, through God’s grace first enlightening my mind. In pamphlet, The Sidereal Messenger (1610), reprinted in The Sidereal Messenger of Galileo Galilei: And a Part of the Preface to the Preface to Kepler's Dioptrics Containing the Original Account of Galileo's Astronomical Discoveries (1880), 9. 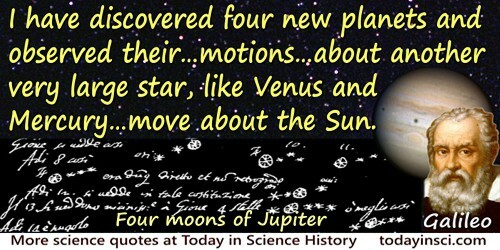 But what exceeds all wonders, I have discovered four new planets and observed their proper and particular motions, different among themselves and from the motions of all the other stars; and these new planets move about another very large star [Jupiter] like Venus and Mercury, and perchance the other known planets, move about the Sun. As soon as this tract, which I shall send to all the philosophers and mathematicians as an announcement, is finished, I shall send a copy to the Most Serene Grand Duke, together with an excellent spyglass, so that he can verify all these truths. Letter to the Tuscan Court, 30 Jan 1610. Quoted in Albert van Heiden (ed. ), Siderius Nuncius or The Sidereal Messenger (1989), 18. Could this have just happened? Was it an accident that a bunch of flotsam and jetsam suddenly started making these orbits of its own accord? I can't believe that. … Some power put all this into orbit and keeps it there. Reflecting on the orderliness of the whole universe, printed in Reader’s Digest (Jul 1962), 38. As cited in Tiebet Joshua, Bible Versus Science: Which is More Authentic? (2015), Sec. 4.1. For many planet hunters, though, the ultimate goal is still greater (or actually, smaller) prey: terrestrial planets, like Earth, circling a star like the Sun. Astronomers already know that three such planets orbit at least one pulsar. But planet hunters will not rest until they are in sight of a small blue world, warm and wet, in whose azure skies and upon whose wind-whipped oceans shines a bright yellow star like our own. I had made considerable advance ... in calculations on my favourite numerical lunar theory, when I discovered that, under the heavy pressure of unusual matters (two transits of Venus and some eclipses) I had committed a grievous error in the first stage of giving numerical value to my theory. My spirit in the work was broken, and I have never heartily proceeded with it since. Private note (29 Sep 1890). In George Biddell Airy and Wilfrid Airy (ed. ), Autobiography of Sir George Biddell Airy (1896), 350. I have decided today that the United States should proceed at once with the development of an entirely new type of space transportation system designed to help transform the space frontier of the 1970s into familiar territory, easily accessible for human endeavor in the 1980s and ’90s. This system will center on a space vehicle that can shuttle repeatedly from Earth to orbit and back. It will revolutionize transportation into near space, by routinizing it. It will take the astronomical costs out of astronautics. In short, it will go a long way toward delivering the rich benefits of practical space utilization and the valuable spin-offs from space efforts into the daily lives of Americans and all people. In unpublished manuscript, 'Is There a God', (5 Mar 1952) written for the magazine, Illustrated. Collected in Bertrand Russell, John G. Slater (ed.) and Peter Köllner (ed.) The Collected Papers of Bertran Russell: Volume II: Last Philosophical Testament: 1943-68 (1997), 547-548. In the celestial spaces above the Earth’s atmosphere; in which spaces, where there is no air to resist their motions, all bodies will move with the greatest freedom; and the Planets and Comets will constantly pursue their revolutions in orbits … by the mere laws of gravity. In 'General Scholium' from The Mathematical Principles of Natural Philosophy (1729), Vol. 2, Book 3, 388. It is clear that the earth does not move, and that it does not lie elsewhere than at the center. On the Heavens (2004), 54. I’m just a speck, standing on this big planet. … The Earth is orbiting the Sun, and the Sun is a huge star. And our star may be a big deal to us, but, my friends, our star is just another speck. … It’s not really in downtown Milky Way, it’s way out on the side. … I'm a speck, living on a speck, orbiting a speck in the middle of specklessness. But … I have this brain … to think about all of this. To think about the vast emptiness of space. I can reason that I'm a speck on a speck in the middle of specklessness. And that’s cool. That’s worthy of respect. 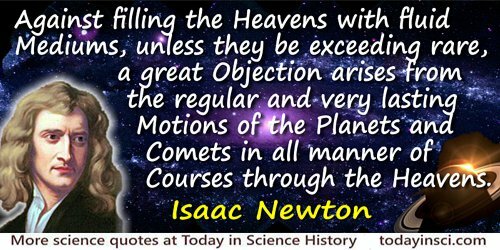 Kepler’s laws, although not rigidly true, are sufficiently near to the truth to have led to the discovery of the law of attraction of the bodies of the solar system. The deviation from complete accuracy is due to the facts, that the planets are not of inappreciable mass, that, in consequence, they disturb each other's orbits about the Sun, and, by their action on the Sun itself, cause the periodic time of each to be shorter than if the Sun were a fixed body, in the subduplicate ratio of the mass of the Sun to the sum of the masses of the Sun and Planet; these errors are appreciable although very small, since the mass of the largest of the planets, Jupiter, is less than 1/1000th of the Sun's mass. In Isaac Newton and Percival Frost (ed.) Newton’s Principia: Sections I, II, III (1863), 216. My own lifetime spans the Wright Brothers' Kitty Hawk flight and manned-satellite orbiting. No idea should be suppressed. … And it applies to ideas that look like nonsense. We must not forget that some of the best ideas seemed like nonsense at first. The truth will prevail in the end. Nonsense will fall of its own weight, by a sort of intellectual law of gravitation. If we bat it about, we shall only keep an error in the air a little longer. And a new truth will go into orbit. In Cecilia Payne-Gaposchkin: An Autobiography and Other Recollections (1996), 233. No one in his senses, or imbued with the slightest knowledge of physics, will ever think that the earth, heavy and unwieldy from its own weight and mass, staggers up and down around its own center and that of the sun; for at the slightest jar of the earth, we would see cities and fortresses, towns and mountains thrown down. Universae Naturae Theatrum (1597). In Dorothy Stimson, The Gradual Acceptance of the Copernican Theory of the Universe (1917), 45. Referring to the Law of Gravitation. From Poem, 'On a Tear' (c.1813-15), in Samuel Rogers et al., The Poetical Works of Rogers, Campbell, J. Montombery, Lamb, and Kirke White (1836), 101. One of the most striking results of modern investigation has been the way in which several different and quite independent lines of evidence indicate that a very great event occurred about two thousand million years ago. The radio-active evidence for the age of meteorites; and the estimated time for the tidal evolution of the Moon's orbit (though this is much rougher), all agree in their testimony, and, what is far more important, the red-shift in the nebulae indicates that this date is fundamental, not merely in the history of our system, but in that of the material universe as a whole. The Solar System and its Origin (1935), 137. Over very long time scales, when the perturbing influences of both Jupiter and Saturn are taken into account, the seemingly regular orbits of asteroids that stray into the Kirkwood gaps turn chaotic. For millions of years … such an orbit seems predictable. Then the path grows increasingly eccentric until it begins to cross the orbit of Mars and then the Earth. Collisions or close encounters with those planets are inevitable. In article 'Tales of Chaos: Tumbling Moons and Unstable Asteroids", New York Times (20 Jan 1987), C3. Science corrects the old creeds, sweeps away, with every new perception, our infantile catechisms, and necessitates a faith commensurate with the grander orbits and universal laws which it discloses yet it does not surprise the moral sentiment that was older and awaited expectant these larger insights. Hialmer Day Gould and Edward Louis Hessenmueller, Best Thoughts of Best Thinkers (1904), 330. Scientists constantly get clobbered with the idea that we spent 27 billion dollars on the Apollo programs, and are asked “What more do you want?” We didn't spend it; it was done for political reasons. ... Apollo was a response to the Bay of Pigs fiasco and to the successful orbital flight of Yuri Gagarin. President Kennedy's objective was not to find out the origin of the moon by the end of the decade; rather it was to put a man on the moon and bring him back, and we did that. Quoted by Dennis Meredith, in 'Carl Sagan's Cosmic Connection and Extraterrestrial Life-Wish', Science Digest (Jun 1979), 85, 38 & 89. Reproduced in Carl Sagan and Tom Head, Conversations With Sagan (2006), 55-56. Seeing therefore the variety of Motion which we find in the World is always decreasing, there is a necessity of conserving and recruiting it by active Principles, such as are the cause of Gravity, by which Planets and Comets keep their Motions in their Orbs, and Bodies acquire great Motion in falling; and the cause of Fermentation, by which the Heart and Blood of Animals are kept in perpetual Motion and Heat; the inward Parts of the Earth are constantly warm'd, and in some places grow very hot; Bodies burn and shine, Mountains take fire, the Caverns of the Earth are blown up, and the Sun continues violently hot and lucid, and warms all things by his Light. For we meet with very little Motion in the World, besides what is owing to these active Principles. From Opticks, (1704, 2nd ed. 1718), Book 3, Query 31, 375. Shortly after electrons were discovered it was thought that atoms were like little solar systems, made up of a … nucleus and electrons, which went around in “orbits,” much like the planets … around the sun. If you think that’s the way atoms are, then you’re back in 1910. In QED: The Strange Theory of Light and Matter (1985, 2006), 84. So, Fabricius, I already have this: that the most true path of the planet [Mars] is an ellipse, which Dürer also calls an oval, or certainly so close to an ellipse that the difference is insensible. Letter to David Fabricius (11 Oct 1605). Johannes Kepler Gesammelte Werke (1937- ), Vol. 15, letter 358, l. 390-92, p. 249. The Earth does not orbit the sun because of any gravitational pull that the sun exerts on Earth; rather, the sun, being a rather massive object, warps the fabric of space time around it, and the Earth, in attempting to move in a straight line, is instead placed into its near-circular orbit around the sun due to this warping. In column, 'In Our Skies: Surfing the Gravitational waves of Einstein’s theory', Ruidoso News (online 25 Feb 2016), on ruidosonews.com website. The earth in its rapid motion round the sun possesses a degree of living force so vast that, if turned into the equivalent of heat, its temperature would be rendered at least one thousand times greater than that of red-hot iron, and the globe on which we tread would in all probability be rendered equal in brightness to the sun itself. 'On Matter, Living Force, and Heat' (1847). In The Scientific Papers of James Prescott Joule (1884), Vol. 1, 271. In James Wood, Dictionary of Quotations from Ancient and Modern, English and Foreign Sources (1893), 427:37. The field cannot well be seen from within the field. The astronomer must have his diameter of the earth’s orbit as a base to find the parallax of any star. In Essay 10, 'Circles', Essays by R.W. Emerson (1841), 314. The kinetic concept of motion in classical theory will have to undergo profound modifications. (That is why I also avoided the term “orbit” in my paper throughout.) … We must not bind the atoms in the chains of our prejudices—to which, in my opinion, also belongs the assumption that electron orbits exist in the sense of ordinary mechanics—but we must, on the contrary, adapt our concepts to experience. Letter to Niels Bohr (12 Dec 1924), in K. von Meyenn (ed. ), Wolfgang Pauli - Wissenschaftliche Korrespondenz (1979), Vol. 1, 188. Quoted and cited in Daniel Greenberger, Klaus Hentschel and Friedel Weinert, Compendium of Quantum Physics: Concepts, Experiments, History and Philosophy (2009), 615. There may be some interest in one of my own discoveries in physics, entitled, “A Method of Approximating the Importance of a Given Physicist.” Briefly stated, after elimination of all differentials, the importance of a physicist can be measured by observation in the lobby of a building where the American Physical Society is in session. The importance of a given physicist varies inversely with his mean free path as he moves from the door of the meeting-room toward the street. His progress, of course, is marked by a series of scattering collisions with other physicists, during which he remains successively in the orbit of other individuals for a finite length of time. A good physicist has a mean free path of 3.6 ± 0.3 meters. The shortest m.f.p. measured in a series of observations between 1445 and 1947 was that of Oppenheimer (New York, 1946), the figure being 2.7 centimeters. I know. I was waiting for him on the street. In 'A Newsman Looks at Physicists', Physics Today (May 1948), 1, No. 1, 33. Address to the Mechanics Institute, 'An Address on the Genius and Discoveries of Sir Isaac Newton' (1835), excerpted in paper by Luis M. Laita, Luis de Ledesma, Eugenio Roanes-Lozano and Alberto Brunori, 'George Boole, a Forerunner of Symbolic Computation', collected in John A. Campbell and Eugenio Roanes-Lozano (eds. ), Artificial Intelligence and Symbolic Computation: International Conference AISC 2000 (2001), 3. They were in orbit around the planet now, and its giant curving bulk loomed so huge that he could see nothing else, nothing but the bands and swirls of clouds that raced fiercely across Jupiter’s face. The clouds shifted and flowed before his eyes, spun into eddies the size of Asia, moved and throbbed and pulsed like living creatures. Lightning flashed down there, sudden explosions of light that flickered back and forth across the clouds, like signalling lamps. We are insignificant creatures on a small rock orbiting a very average star in the outer suburbs of one of a hundred thousand million galaxies. From interview with Ken Campbell in Channel 4 TV program 'Beyond Our Ken', episode 3 of Reality on the Rocks (1995). We have the satisfaction to find, that in nature there is wisdom, system and consistency. For having, in the natural history of this earth, seen a succession of worlds, we may from this conclude that, there is a system in nature; in like manner as, from seeing revolutions of the planets, it is concluded, that there is a system by which they are intended to continue those revolutions. But if the succession of worlds is established in the system of nature, it is vain to look for anything higher in the origin of the earth. The result, therefore, of our present enquiry is, that we find no vestige of a beginning,-no prospect of an end. 'Theory of the Earth', Transactions of the Royal Society of Edinburgh, 1788, 1, 304. We live on an obscure hunk of rock and metal circling a humdrum sun, which is on the outskirts of a perfectly ordinary galaxy comprised of 400 billion other suns, which, in turn, is one of some hundred billion galaxies that make up the universe, which, current thinking suggests, is one of a huge number—perhaps an infinite number—of other closed-off universes. From that perspective, the idea that we’re at the center, that we have some cosmic importance, is ludicrous. From interview with Linda Obst in her article 'Valentine to Science', in Interview (Feb 1996). Quoted and cited in Tom Head (ed. ), Conversations with Carl Sagan (2006), ix, and cited on p.xix. We were flying over America and suddenly I saw snow, the first snow we ever saw from orbit. I have never visited America, but I imagined that the arrival of autumn and winter is the same there as in other places, and the process of getting ready for them is the same. And then it struck me that we are all children of our Earth. As quoted in Kevin W. Kelley (ed. ), The Home Planet (1988). Source cited as “submitted by Lev Demin”. When I orbited the Earth in a spaceship, I saw for the first time how beautiful our planet is. Mankind, let us preserve and increase this beauty, and not destroy it! From Cosmologische Briefe über die Einrichtung des Weltbaues (1761). As quoted in Carl Sagan, Broca’s Brain: Reflections on the Romance of Science (1986), 95. Without any doubt, the regularity which astronomy shows us in the movements of the comets takes place in all phenomena. The trajectory of a simple molecule of air or vapour is regulated in a manner as certain as that of the planetary orbits; the only difference between them is that which is contributed by our ignorance. Probability is relative in part to this ignorance, and in part to our knowledge. Philosophical Essay on Probabilities (1814), 5th edition (1825), trans. Andrew I. Dale (1995), 3.